Warcraft, SimCity, Super Mario Bros. 3; all of these have become trademarks of the videogame industry for both their popularity and the ingenuity of their gameplay. These games, among others, are part of a compiled list of videogames, a canon, naming them among the top ten videogames ever created. Significant to videogame history and development but missing from this list is The Oregon Trail. This game demonstrates the same attributes as those already on the canon because it sets a precedent for future games of its nature, plays an important role in videogame culture, and creates compelling storylines and actions that keep the player involved from start until finish. Both for its nostalgic and technical values, The Oregon Trail is certainly worthy of enough praise to be included as part of the videogame canon. The Oregon Trail was developed for a mainframe computer by a group of student teachers in Minnesota in 1971 (IGN 2011). One of these students, Don Rawitsch, debuted the game to his class, who loved it. Rawitsch then took a job with Minnesota Educational Computing Consortium (MECC) developing educational software in 1974, and by 1978, Apple II computers in schools came programmed with The Oregon Trail; the game was produced in cooperation with The Learning Company and Brøderbund. One of the first games ever to use simulation through characters, The Oregon Trail is an adventure game, but follows a tighter plot line than other games of its era. Both Spacewar! and Star Raiders, members of the canon, incorporate fantastical and science fiction elements that were popular of that time. In contrast, The Oregon Trail follows the historical events that made up the actual journey across the United States into Oregon Territory in the 1800s, breaking ground into a new subgenre of adventure games and their themes. This game was the first of its kind to allow children to learn historical information while playing a game and having fun. 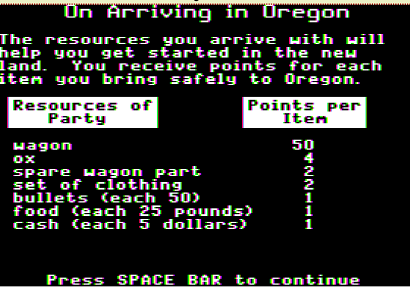 The game allows players to create a personalized party to journey to Oregon with, as well as having a budget for goods, food, and other necessities. The preparations made for harsh winters, disease, and hunger forced players to be realistic and wise, knowing that each of their decisions had potential consequences. This, in turn, can help players gain real-life skills about budgeting, prioritizing, and responsibility. The popularity of The Oregon Trail can be seen through its many versions that have continued throughout the years since the original production. Sequels began in 1993 with The Oregon Trail Version 1.2, an immensely popular The Oregon Trail 4th Edition in 1999, and recent updates include games for mobile phones and a Facebook application, released 2 February 2011 (Wikipedia 2011). In addition, there have been similar adventure and exploration games of the historical genre, such as The Yukon Trail and The Amazon Trail; though the two of these also have considerable fanbases, the original still continues to be the most popular. The subculture that has been created by The Oregon Trail persists today, and is seen through various aspects of the media from T-shirts and franchise goods to an immortalization of the slogan “You have died of dysentery”. Videogame culture has also been influenced by The Oregon Trail because of the presence of historic videogames, and realistic games in general, rather than fantasies of outer space and other abstract elements. The game also creates a purpose of adventure, not simply the defeat of an enemy, as in most videogames. The complex elements of story and plot add to the value of the game, and lay the foundation for future adventure games of any kind. Instead of simply defeating an opponent, the players must make decisions such as whether or not to cross a river or wait for low-tide, and whether or not to bury deceased party members. Hunting is also vital to this game, providing a source of food for the members of the party. Chance and luck are also a huge part of this game, where natural occurrences randomly happen, adding apprehension and surprise, as well as frustration. The scoring of this game is also different than most of its time. Inventory is taken into account, as are health, survival, and currency on hand. Unlike Spacewar! where the winner is simply whoever shoots out the other player first, there is no competition, simply a journey with specific tasks and elements. There are also destinations along the journey, providing a scope of place and setting instead of just one or a few images as in previous games. This has expanded with the improvement of graphics and the ability to interact more in the game. Also unlike any games before it, and few after, The Oregon Trail provides an educational element that parents and teachers alike want their children to experience. The popularity of the game among elementary students in the 1980s and 1990s, and still today, is because of the fun and interactive elements, as well as learning about what life was like in the West and on the journey there. According to an article by Levi Buchanan, the original Oregon Trail is “one of the greatest, if not the greatest, examples of edutainment software” (Buchanan 2009). This is due to the entertaining and informative aspects of the game that make it so appealing to many generations. With a new iPhone game, there is still success to be found, but with added concepts and superb graphics. Despite newer and more modern games, this new addition to iPhone’s games is given an eight out of ten by IGN, with the comment that it is “great” and excels in various categories, particularly in presentation and graphics (Buchanan 2009). The ability for a game to breach generation gaps, expand to different platforms, and remain insanely popular is quite an incredible feat, and one that The Oregon Trail demonstrates. Statistics also prove the sustainable popularity of this game- since its release in 1978 it has sold over 65 million copies worldwide (Lussenhop 2011). With the duration of popularity and the addition of new games, The Oregon Trail is not simply a classic videogame; it is a franchise of entertainment. Ever since its first publication in 1978, its combination of both adventure and educational elements have made it popular with both children, parents, and teachers alike. Videogames do indeed have a greater purpose than simply being fun and entertaining, which this game series clearly demonstrates. The Oregon Trail is the first of its kind to incorporate a clear storyline and adventure elements, as well as provide an historical and realistic plot and setting, rather than science fiction types of the day. The game set the precedence for modern adventure games, and created with it a subculture that is still very much relevant today. Blankinship, Amy. Creative genius. (Helped with title.) 30 March 2011. Buchanan, Levi. "The Oregon Trail IPhone Review - IPhone Review at IGN." Apple IPhone - IPod Touch & IPhone Games, Cheats, Walkthroughs, News, Reviews, Previews, Game Trailers & Videos at IGN. 13 Mar. 2009. Web. 24 Mar. 2011. .
"IGN: The Oregon Trail." PC Games, Cheats, Walkthroughs, News, Reviews, Previews, Game Trailers & Videos - IGN. Web. 14 Mar. 2011. .
Lussenhop, Jessica. "Oregon Trail: How Three Minnesotans Forged Its Path - Page 1 - News - Minneapolis - City Pages." News, Events, Restaurants, Music. 19 Jan. 2011. Web. 26 Mar. 2011. .
"The Oregon Trail (video Game)." Wikipedia, the Free Encyclopedia. 24 Mar. 2011. Web. 26 Mar. 2011. .